SALES at Inditex – owner of the Zara group of mainstream fashion stores – topped €26bn for the first time last year. While investors reacted negatively to the group’s results – the share price was down over 4pc on Wednesday – the sales show that Inditex companies remain among the most successful retailers on the main street, in what is an increasingly challenging market. The company, which was founded as a family business in 1963, has a legion of fans, including British royal Kate Middleton, who famously wore Zara’s royal blue wrap dress at the announcement of her engagement to Prince William in 2011. The group also benefits from its relative affordability. A Zara sequinned tweed jacket inspired by Karl Lagerfeld’s designs carried a price tag of €69.95 and was in shops almost as soon as its inspiration was in fashion magazines. At Zara, new products are also limited in supply, increasing the sense of exclusivity. In Ireland Inditex operates nine Zara stores, three Pull & Bear shops, two of the more upmarket Massimo Dutti stores, and six of its Bershka shops, which it aims at a younger market. Being on-trend is one thing, however the group’s crucial edge over main street rivals is the speed with which it gets on-trend fashion produced and to the shelves. Unlike most rivals that manufacture mainly in Asia, Zara and its sister brands are produced close to, and even in, the European market. There’s a three-week turnaround from drawing board to store. With a keen eye for the very latest trend it has been able to stay ahead in the market with the most up to date shoppers. Inditex, which has 7,490 stores in 96 markets, has invested heavily in the supply chain. Over half of the group’s suppliers and manufacturers are in countries such as Portugal, Turkey and Morocco – close to the main EU markets. Inditex also has 11 factories in its home market in Spain. That means logistics that allow it to update its physical and online store collections twice a week. Inditex can deliver orders to stores anywhere in the world within 48 hours. In a sector coping with the threat from online rivals, the group overhauled its websites in 2018. 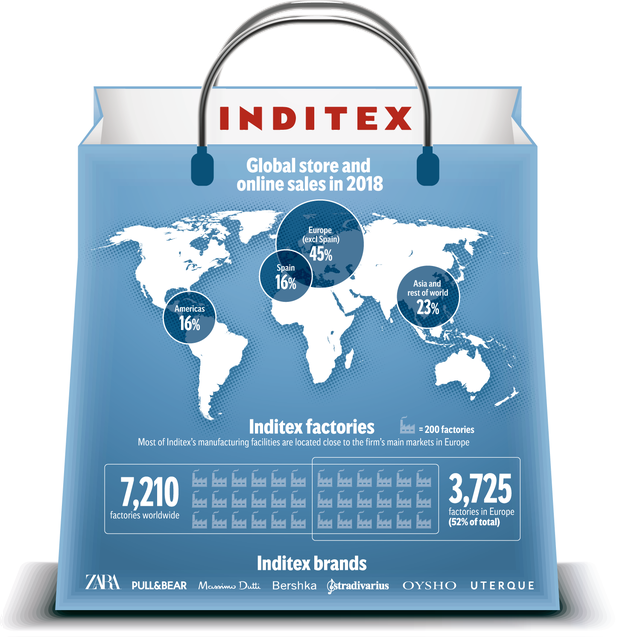 Last year the online stores of Inditex brands registered 2.94bn visits, reflecting growth of 500m year-on-year, while revenue from its online business jumped 27pc to €3.2bn in 2018, accounting for 12pc of the company’s net sales. The group has not shunned its bricks and mortar stores in favour of online, however. In 2018 it launched augmented reality experiences in a number of its stores, which allows customers to see models wearing the clothes they’ve chosen via sensors. The accumulation of the above has seen Inditex’s bottom line grow, with its brands reporting a 4pc increase in like-for-like sales in 2018, while some of its competitors have struggled.